Biochar production systems can be classified as either pyrolysis or gasification systems. The pyrolysis of biomass results in three main products: a solid (bio-char), a liquid (bio-oil), and a gas (syngas). Furthermore, pyrolysis becomes self-sustaining as syngas that is produced combusts, generating additional heat for the production process. Gasification on the other hand produces smaller quantities of biochar in a directly-heated reaction vessel with introduced air. Although pyrolysis systems result in higher concentrations of biochar, both production systems can be developed as mobile or stationary units as per the need and availability of the feedstock. Historically, there has been a steady demand for the use of wood residues in paper and engineered wood products and in the landscaping industry. However, biomass energy markets, another major outlet for wood residues, have been depressed in recent years largely due to low fossil fuel prices and relatively mild winter temperatures across the northern US. As a result, finding alternative markets for low-value, underutilized wood products generated from mill processes and forest management activities are becoming a growing interest. An emerging biochar industry shows some promise as a solution for utilizing these woody biomass materials. Many factors impact the development of biochar markets including the need for consumer education and marketing, the establishment of product quality standards, and additional research and technology transfer efforts. 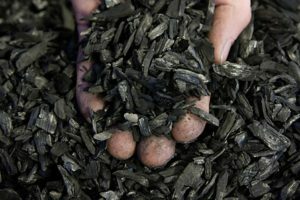 According to a 2018 report published by Dovetail Partners, the US biochar industry consists of approximately 135 firms that produce between 35,000 to 70,000 tons of biochar per year. The market potential, however, is estimated at over 3 billion tons annually. Biochar can be used in as a soil amendment in agricultural applications and as media for storm water and wastewater filtration and environmental remediation efforts. Beyond these applications, other areas of interest among the biochar industry is the use of biochar as a livestock feed supplement and as an animal litter additive. In Europe, biochar as a feed ingredient is believed improve herd health while also reducing overall methane production and manure odor. It should be noted, however, that research has yet to fully investigate the potential benefits of biochar as a feed supplement. In Wisconsin, biochar has gained interest as a soil amendment although the size of the market remains relatively small. For example, several nurseries in the state have incorporated biochar in their plantings and operations. In addition, the University of Wisconsin Madison Arboretum has partnered with the Wisconsin Department of Natural Resources, Forest Health program on a research project to explore the role of biochar amendments in improving soil quality while also controlling invasive jumping worm populations. Past and current research demonstrates that markets for biochar are experiencing growth and will likely continue to grow with additional research and marketing of potential uses and benefits. This expected market growth will have a positive impact on the forest products sector because it can expand the use of underutilized woody biomass generated by wood manufacturing and forest management activities. Furthermore, biochar can be a value-added product for existing forest businesses or it can be a stand-alone venture in locations with an available supply of woody biomass. Please visit the International Biochar Initiative or the US Biochar Initiative for information related to biochar research, product uses, or production methods.